Lydia Mathis, a sophomore at Belhaven University, in Jackson, Mississippi, was inspired to help refugees after visiting Samaritan’s Purse Community Center several times last year. There she saw enrichment classes like sewing, painting, and cooking helping people recover from trauma along with their counseling. It gave Mathis an idea – using dance classes as a form of therapy to help refugees as well. 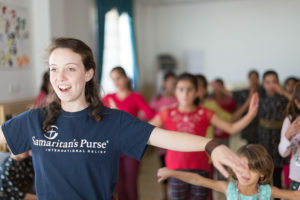 Lydia Mathis, a student at Belhaven University, led a dance class designed as a form of therapy to children at a Yazidi refugee camp in northern Iraq. Photo courtesy of Samaritan’s Purse. Over the summer of 2017, Mathis spent five weeks at a Yazidi refugee camp in the Dohuk area of Northern Iraq to teach dance. The Yazidi are a Kurdish religious minority group that has been targeted and displaced by ISIS since August 2014. 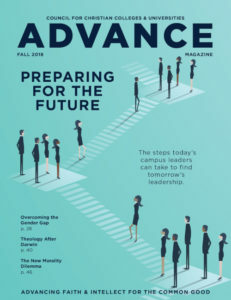 “I built the structure and objectives with a lot of input from those at the center who have worked with the Yazidis for years, including the trauma therapist,” says Mathis. Mathis taught ballet and modern classes to Yazidi youth but adapted classes after she assessed their needs. The end result was a class that utilized ballet, modern, and creative movement together. She taught classes to more than 60 children divided into two groups: one for 3- to 8-year-olds and another to 9- to 14-year-olds. Mathis says that one of the greatest lessons she learned was that when dealing with trauma, even the small things count. It has deepened her desire to pursue expressive arts therapy as a career.